Curatorial Challenges investigates the challenges faced by curators in contemporary society and explores which practices, ways of thinking, and types of knowledge production curating exhibitions could challenge. 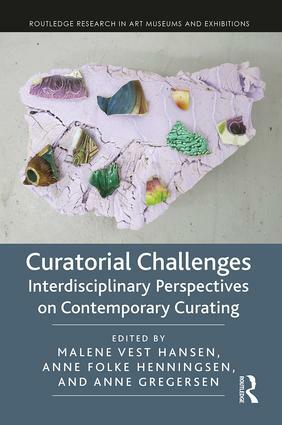 Bringing together international curators and researchers from the fields of art and cultural history, the book provides new research and perspectives on the curatorial process and aims to bridge the traditional gap between theoretical and academic museum studies and museum practices. The book focuses on exhibitions as a primary site of cultural exchange and argues that, as highly visible showcases, producers of knowledge, and historically embedded events, exhibitions establish and organize meanings of art and cultural heritage. Temporary exhibitions continue to increase in cultural significance and yet the traditional role of the museum as a Bildung institution has changed. As exhibitions gain in significance, so too do curatorial strategies. Arguing that new research is needed to help understand these changes, the book presents original research that explores how curatorial strategies inform both art and cultural history museums in contemporary society. The book also investigates what sort of critical, transformative, and perhaps even conservative, potential can be traced in exhibition cultures. Curatorial Challenges fosters innovative interdisciplinary exchange and brings new insights to the field of curatorial studies. As such, it should be of great interest to academics, researchers, and postgraduate students engaged in the study of curatorial practice, museum studies, the making of exhibitions, museum communication, and art history. Malene Vest Hansen is Associate Professor of Art History at the University of Copenhagen. Anne Folke Henningsen is Associate Professor of Ethnology at the University of Copenhagen. Anne Gregersen is Curator at the J.F. Willumsens Museum and a Postdoctoral Fellow at the University of Copenhagen.